systems, some operations may not apply to you.
? The features described in this guide are common to most models. The dashed part is invisible. keyboard. Otherwise, the display panel may be damaged. The stereo speakers provide rich and powerful sound. Press this button to turn on the computer. Note: For details, see ?OneKey Rescue system? on page 30. For details, see ?Cap Sensor buttons? on page 20. The touchpad functions as a conventional mouse. Note: For details, see ?Using the touchpad? on page 13. Attach a security lock (not supplied) here. Note: For details, see ?Attaching a security lock (not supplied)? on page 24. Connects to external display devices. This port connects the computer to an Ethernet network. Note: For details, see ?Wired connection? on page 26. Note: For details, see ?Connecting USB devices? on page 18. Connect the AC adapter here. Note: For details, see ?Using AC adapter and battery? on page 11. Insert memory cards (not supplied) here. Note: For details, see ?Using memory cards (not supplied)? on page 17. For details, see ?System status indicators? on page 23. Read the supplied manuals before using your computer. The supplied battery pack is not fully charged at purchase. charged while the computer is running on AC power. Refer to the supplied Setup Poster to install the battery pack. 1 Connect the power cord to the AC adapter. 3 Plug the power cord into an electrical outlet. configuration process may include the procedures below.
? Click and select Sleep from the Start menu.
? Press Fn + F1. hard disk is spinning can damage the hard disk, causing loss of data. To wake the computer, do one of the following.
? Press any key on the keyboard. If you are not going to use your computer for a day or two, shut it down. the battery icon in the notification area.
? The amount of energy stored in the battery when you commence work. disk drive and how bright you make the computer display. or replace it with a fully charged one. particles from entering the inside of your computer. battery immediately after it drops from fully charged.
? Charge the battery at a temperature between 50 °F and 86 °F (10 °C-30 °C).
? Full charge or discharge is not required. sure the computer has been shut down.
? Replace only with a battery of the type recommended by Lenovo.
? Keep the battery pack away from fire.
? Do not expose the battery pack to water or rain.
? Do not attempt to disassemble the battery pack.
? Do not short-circuit the battery pack.
? Keep the battery pack away from children. you want the cursor to move. lit, the touchpad is disabled. keypad. To enable or disable the numeric keypad, press Fn + F8. numeric keypad, press the Num Lock key. Turn on/off the integrated camera. Turn on/off the backlight of the LCD screen. 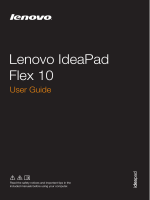 to select this notebook or an external display. Start/Pause playback of Windows Media Player. Stop playback of Windows Media Player. Skip to the previous track. Skip to the next track.
? Insert ONLY one card in the slot at a time.
? This card reader does not support SDIO devices (e.g., SDIO Bluetooth, etc.). out of the memory card slot. 2 Slide the memory card in until it clicks into place. 1 Push the memory card until you hear a click. 2 Gently pull the memory card out of the memory card slot. and eject media utility to avoid data corruption. Your computer comes with 3 or 4 USB ports compatible with USB devices. connecting it. Otherwise, the device may not be recognized. these devices without cables and up to 10 meters range in open space. Note: The actual maximum range may vary due to interference and transmission barriers. Press Fn + F5 to make configuration.
? When you do not need to use the Bluetooth function, turn it off to save battery power. for details on how to pair the device with your computer. computer is in intelligent mode. The computer switches to the selected mode after 2 seconds. Provides enhanced visual and audio output. mode according to the program that is running.
? You can enable or disable the OneKey Theater feature via the Start menu.
? Some programs may not be compatible with intelligent mode. feature by pressing and releasing the thermal control button. performance when the computer is running in super silent mode. highlighted. Dust cleaning will start after about three seconds. environment with good ventilation when performing dust cleaning. System status indicators -------------------------------------------------------------------These indicators inform you of the computer status. from theft and unauthorized use. function, quality or performance of locking devices and security features. the desktop to register your facial image.
? You can determine whether to use this function when you log on the system. For more details on VeriFace, see the software help. Using passwords helps prevent your computer from being used by others. computer cannot be used unless you enter the correct password. Note: This password can be from one to seven alphanumeric characters in any combination. screen in BIOS setup utility. while the computer is starting up. Wired connection: use physical wiring to connect. Wireless network technology: connect without wiring. the residential cable TV line. Note: The above diagrams are for reference only. Actual connection method may vary. stay online anywhere the wireless signal covers. based on the following standards. systems to cover a metropolitan area, providing highspeed broadband access without the need for cables. Note: Your computer may not support all wireless connection methods. To enable wireless communications, press Fn + F5 to make configuration. Support Center for details on how to configure your computer. Icon on the desktop to launch Lenovo OneKey Recovery. drive, other storage devices, or by creating recovery discs. adapter and battery pack to your computer. For more instructions, see the Help file of Lenovo OneKey Recovery. below to access OneKey Rescue system.
? Shut down your computer. key to launch OneKey Rescue system. start and restore your computer in case of a system failure.
? Insert a recordable disc into the optical drive on your computer.
? On the main screen, click Create Recovery Disc.
? Insert additional recordable disc(s) when prompted. the media. Also make sure your optical drive is compatible with the disc intended for use.
? After recovery disc creation, number the discs appropriately for use in their correct order. The first disc created will be used to start the computer in the case of a system failure. How can I prevent problems with my computer? What are the main hardware features of my computer? More information can be found in Chapter 1 and 2. Where can I find the detailed specifications for my computer? disk drive, memory, or the keyboard. See ?Appendix A. CRU instructions? on page 39 of this guide. Where are the recovery discs? 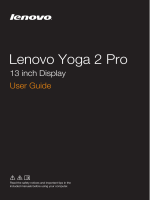 the alternative recovery methods offered by Lenovo, see ?Chapter 4. OneKey Rescue system? on page 30. Where are the installation discs for preinstalled programs? site to find all preinstalled software downloads. software in the APP folder under the D driver. How can I install the device drivers? you need in your hard disk. What can I do if the backup process fails? 1 Close other programs, then restart the backup process. When do I need to restore the system to the factory status? comprehensive information in Chapter 2. - The battery is installed correctly. power cord is plugged into a working electrical outlet. - The memory is installed correctly. the cursor on the screen, have the computer serviced. Your screen saver or power management may be enabled. - Press any key on the keyboard. LCD screen has been turned off. representative to have the password changed. and a fee will be charged for parts and service. charged for parts and service. The numeric lock function is on. To disable it, press Fn + F8. mode immediately after Poweron self-test (POST). - The battery is charged. - The operating temperature is within the acceptable range. Note:If the battery is charged and the temperature is within range, have the computer serviced. from sleep mode and the computer does not work. battery is depleted. Check the power indicator. to the computer, then press any key or the power button. power button to resume operation. reset, remove the AC adapter and the battery. button to resume from the sleep mode. problem ?The screen is unreadable or distorted.? - The display device driver is installed correctly. - The screen resolution and color quality are correctly set. - The monitor type is correct. Did you install the operating system or programs correctly? - The Mute function is off. - The headphone jack is not used. - Speakers are selected as the playback device. before the battery status indicator shows empty. Discharge and recharge the battery. with a fully charged battery. ?Chapter 4. OneKey Rescue system? on page 30.
the speaker even when the volume is turned up. The Microsoft? Windows operating system does not start. You are not currently using a Windows operating system. capacity of C, has been modified. from a device you want. remove the AC adapter and the battery. when you are working on the network. the computer starts from the device you want. want the computer starts from. you might damage your computer. recognized, or system shut down may result. 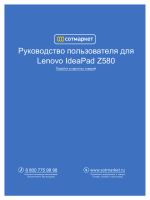 Note:The illustrations used in this chapter are of the Lenovo IdeaPad Z480, unless otherwise stated. Replacing the battery pack ----------------------------------------------------Note: Use only the battery provided by Lenovo. Any other battery could ignite or explode. adapter and all cables from the computer. 2 Close the computer display, and turn the computer over. latch in the unlocked position b , remove the battery pack in the direction shown by the arrow c .
4 Install a fully charged battery pack. 5 Slide the manual battery latch to the locked position. 6 Turn the computer over and reconnect the AC adapter. drive from your reseller or Lenovo marketing representative. bay of the hard disk drive were not designed for frequent changes, or drive swapping.
? The preinstalled software are not included on an optional hard disk drive. such as soft cloth, that absorbs the physical shock.
? Do not apply pressure to the cover of the drive.
? Do not touch the connector. mode, or in hibernation mode. 2 Close the computer display, and then turn the computer over. unit/Mini PCI Express Card slot compartment cover. a.Remove the screw that secure the compartment cover a .
b.Remove the compartment cover b . 5 Remove the frame fixing screws c .
6 Pull the tab in the direction shown by arrow d .
7 Take out the hard disk drive secured in a metal frame e .
8 Remove the screws and detach the metal frame from the hard disk drive. 9 Attach the metal frame to a new hard disk drive and tighten the screws. A Reinstall the frame fixing screws. B Reinstall the compartment cover and tighten the screw. C Reinstall the battery pack. SDRAMs are available in various capacities. when you try to start the computer. touch the contact edge of the DDR3 SDRAM. 3 Close the computer display, and turn the computer over. 4 Remove the battery again. DDR3 SDRAM for future use. and gently insert the DDR3 SDRAM into the socket at a 30-45° angle. both edges of the socket are pushed into the closed position. 0 Reinstall and tighten the screw. 1 Turn the computer on. 5 Disconnect the two wireless LAN cables (one black, one white) a . 6 Remove the screw that secures the wireless LAN card b . 7 Take out the wireless LAN card c .
8 Install the new wireless LAN card. 9 Reinstall and tighten the screw. 0 Reconnect the two wireless LAN cables (one black, one white). cable into the jack labeled 1 and the white cable into the jack labeled 2. A Reinstall the compartment cover and tighten the screw. B Reinstall the battery pack. 2 Remove the screw shown in the illustration a . 3 Gently pull the optical drive out b .
you of where to find replacement instructions. NVIDIA Corporation in the United States and other countries.